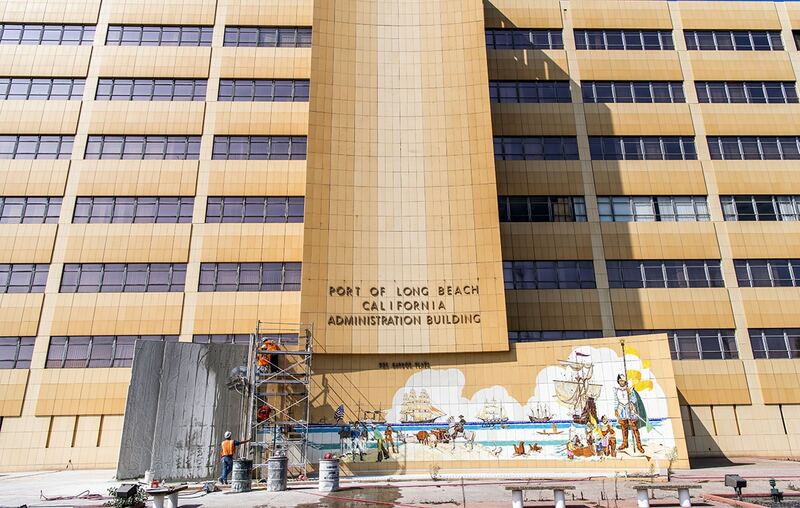 Construction crews and conservationists are a couple of weeks into what’s expected to be a six-week project to remove the tiles that were used to make the 74-foot-long historical mural at the former Port of Long Beach Administrative Building at 925 Harbor Plaza Drive. 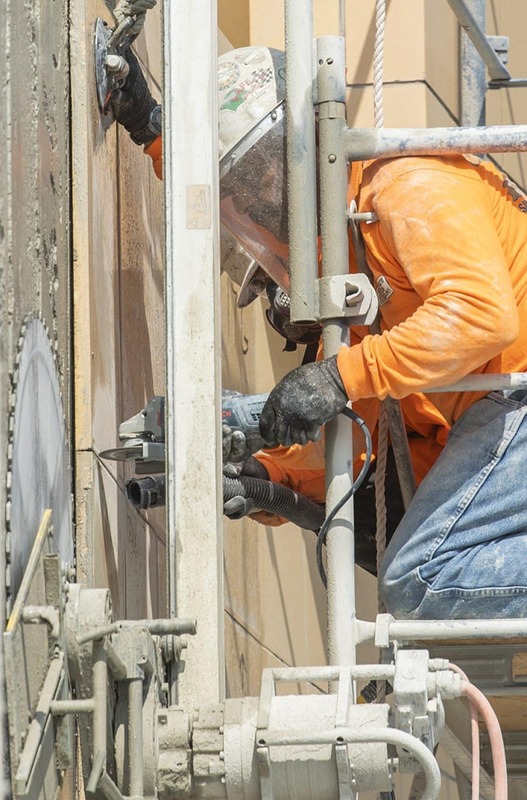 Two men on scaffolding work a specialty saw as they remove a mural, one tile at a time, off the vacant Port of Long Beach building In Long Beach October 5, 2018. Photo by Thomas R. Cordova. 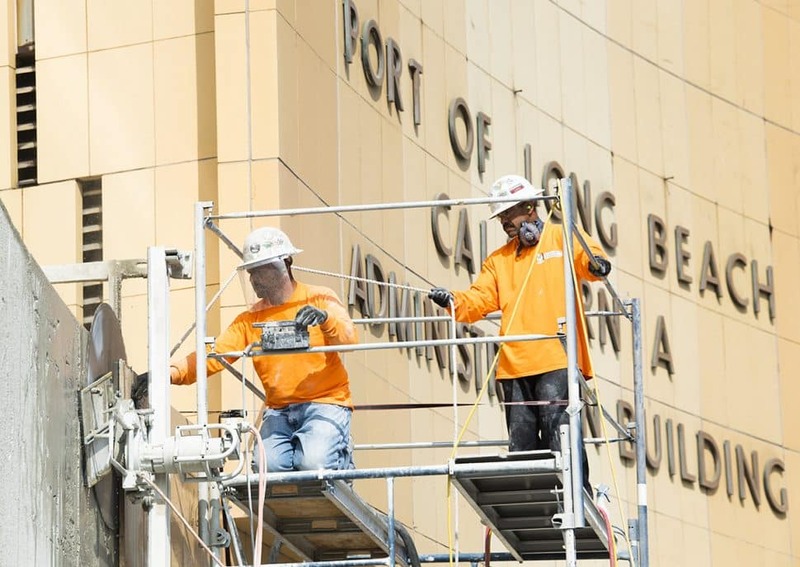 Long Beach Heritage and other groups fought for the preservation of the mural that depicts the history of the port, from Juan Rodriguez Cabrillo’s arrival in San Pedro Bay in 1592, to the unloading of a “modern” freighter in 1960. In between are other significant people and events, including local native tribes, the visit by Sir Francis Drake’s vessel The Golden Hinde and the 1911 opening of the port. 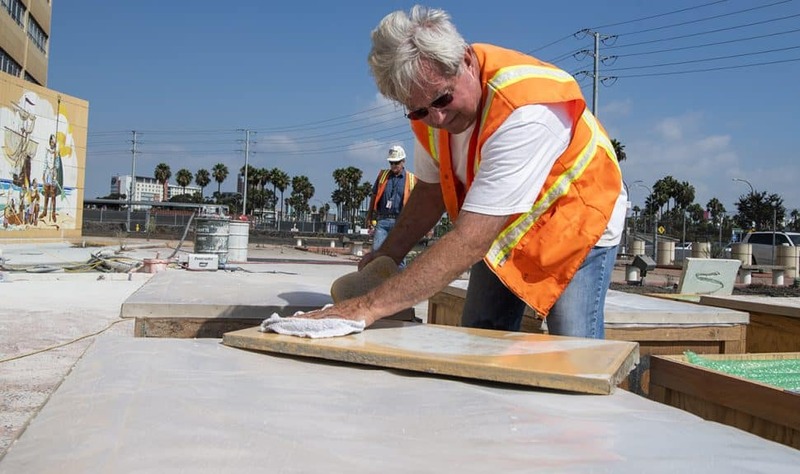 Brian Worley wipes down a tile after it was removed from a mural off the vacant Port of Long Beach building In Long Beach October 5, 2018. Photo by Thomas R. Cordova. In removing the tiles, workers are numbering the pieces for eventual reconstruction of the mural at a location still to be decided. Among suggestions to date are the new civic center complex, a location somewhere along the Promenade (site of another significant mural, the 38-foot tall WPA work “Long Beach Recreation”) and Admiral Kidd and other westside parks. In the meantime, the murals will be stored in crates at a city Public Works yard.